Matt Miller is just an ordinary kid… ordinary, that is, except that his parents are both brilliant university professors, his mom skateboards to work, and he’s a member of The Black Hole Gang. Who are they? They’re kids who love skating, chess, cracking jokes, surfing the web, and hanging out in an awesome clubhouse packed with beakers, terrariums, plant and insect specimens, rock collections, and a telescope named Boris! An urgent email alerts the Gang–Matt, Rose, A.J., Wei Ling, and Newton (Matt’s distinctly above-average mutt)–about a vandalized cave in Missouri that needs cleaning up and protection. 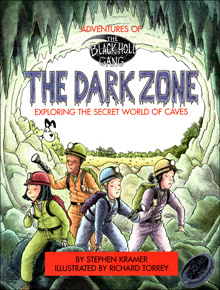 Soon, the Gang’s on their way to a deep, dark caving adventure packed with cool cave creatures, spectacular stalagmites, and even a cave ghost. With so much fun mystery underground, all in comic book format, you’d have to be bats not to come along!